36 Gloucester (279-A Newbury) is located on the NW corner of Gloucester and Newbury, with 34 Gloucester to the north, 284 Newbury to the south, across Newbury, 35 Gloucester (279 Newbury) to the east, across Gloucester, and 281 Newbury to the west. 36 Gloucester (279-A Newbury) was built in 1880-1881 by Frank Jones, mason, and E. C. Landers, carpenter, for building contractor William Seavey Rand, one of four contiguous houses (30-32-34-36 Gloucester) designed as a symmetrical composition and built for the Boylston National Bank of Boston, owner of the land, for speculative sale. William Rand is shown as the owner on the original permit applications, dated May 26, 1880. No architect is indicated on the applications. The land for 30-32-34-36 Gloucester was part of a parcel acquired by the Boylston National Bank on October 21, 1876, from Albert J. Fernald. 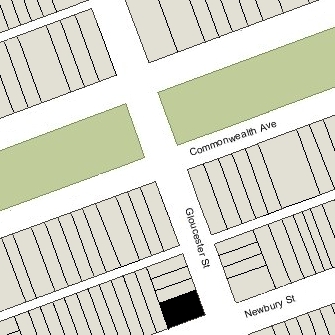 The parcel also included the lots where 284-286-288 Commonwealth were built. William S. Rand also built the houses at 286-288 Commonwealth for the bank. The parcel was part of a larger tract of land originally purchased by Nathan Matthews on January 2, 1871, from David Sears, Jr., Frederick R. Sears, and Knyvet Sears. Click here for an index to the deeds for 36 Gloucester (279-A Newbury). When the completed houses were sold by the Boylston National Bank, the deeds included a four foot wide easement at the rear of 30-32 Gloucester to provide access to the alley for 32-34 Gloucester, and specified the right of all four houses to build sewer drains to the alley. On May 21, 1881, 36 Gloucester was purchased from the bank by Thomas Prince Beal. He lived at 104 Beacon with his father and stepmother, James Henry Beal and Louisa Jane (Adams) Beal. On the same day, his father purchased 30 Gloucester. It became the home of Albert Smith Bigelow and his wife, Mary (DeFord) Bigelow. In October of 1881, Thomas Prince Beal married Ida DeFord, the sister of Mary (DeFord) Bigelow. After their marriage, they made 36 Gloucester their home. Thomas Prince Beal was a banker. In 1888, he was named president of the Second National Bank, succeeding his father in that position (James Henry Beal had been president of the bank since its formation in 1864). Thomas Beal died in May of 1923. His son, Thomas Prince Beal, Jr., succeeded him as president of the Second National Bank. Ida Beal continued to live at 36 Gloucester until her death in May of 1938. She also maintained a home in Beverly. On December 27, 1938, 36 Gloucester was purchased from the Beals’ two sons, Thomas Prince Beal, Jr., and William DeFord Beal, by Nathan Herman. On January 5, 1939, 36 Gloucester was acquired from Nathan Herman by Hilda (Jacobson) Finkelstein, the wife of David A. Finkelstein. They lived in Dorchester and later in Brookline and then in Newton. In April of 1939, he applied for (and subsequently received) permission to convert the property from a single-family dwelling into a store, two offices on the first floor, and six apartments on the second, third, and fourth floors. 36 Gloucester was shown as vacant in the 1939 City Directory. 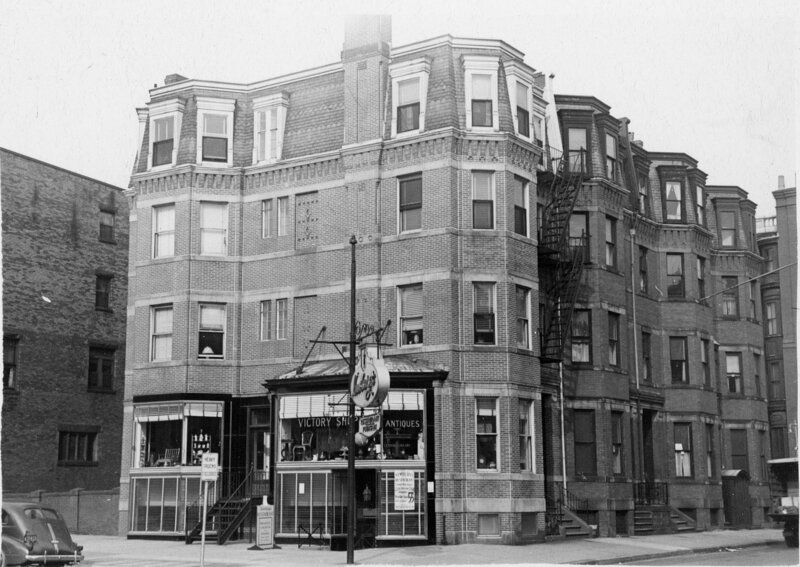 By 1940, it was leased by the Aladdin Cleansers (at 279-1/2 Newbury). It was again shown as vacant in the 1941 City Directory. By 1942, the store space had been replaced by Newbury’s Restaurant, later Newbury’s Steak House, which remained there until about 1960. On April 25, 1962, 36 Gloucester was purchased from the Finns’ two children – Robert E. Finn and Judith (Finn) Viscott, the wife of David S. Viscott – by Gerald R. Ramin. By the early 1960s, the restaurant at 36 Gloucester (279-A Newbury) was Levins Delicatessen & Lunch and then Joe’s Sandwich Shop. By the mid-1960s, it was the Steak Palace and then Jablonski’s Restaurant in the late 1960s. The property changed hands and on October 11, 1965, was purchased by Joseph Raymond. Over the next five years, the property changed owners and on March 16, 1970, was re-acquired by Joseph Raymond as trustee of The Cape Verde Realty Trust. By 1970, 36 Gloucester (279-A Newbury) had become Le Ciro Restaurant. 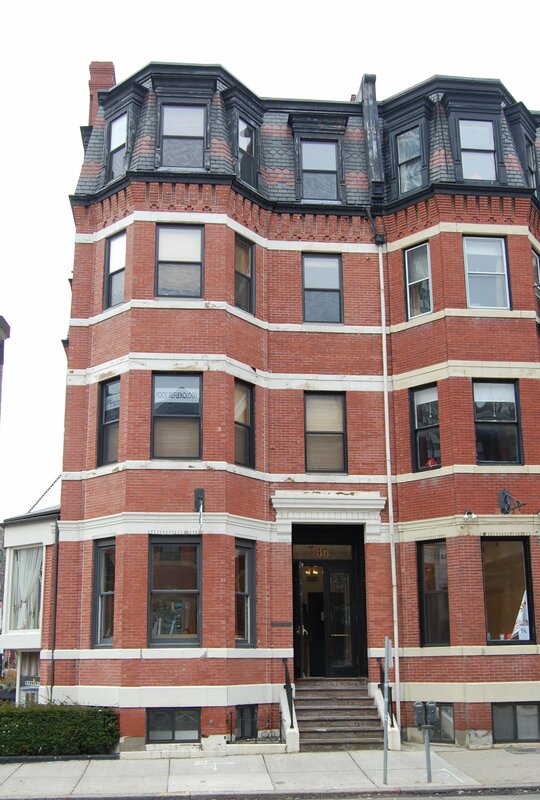 In June of 1973, Joseph Raymond applied for (and subsequently received) permission to legalize the occupancy of 36 Gloucester (279-A Newbury), which the Building Department indicated was “in doubt,” as a restaurant, two offices, and six apartments. By 1973, the restaurant had become Café L’Ananas. In July of 1974, The Cape Verde Trust applied for (and subsequently received) permission to construct a one-story addition for use by the restaurant. Café L’Ananas remained at 36 Gloucester until about 1982. On June 4, 1982, 36 Gloucester (279-A Newbury) was purchased from Samuel J. Mollica, successor trustee of The Cape Verde Realty Trust, by Martha J. Bates and Cary S. Wolinsky, trustees of the Biswas Realty Trust. In November of 1983, Biswas Realty Trust filed for permission to expand the restaurant into the first floor. It also proposed to expand into the basement of 34 Gloucester, where it would locate the restaurant kitchen. 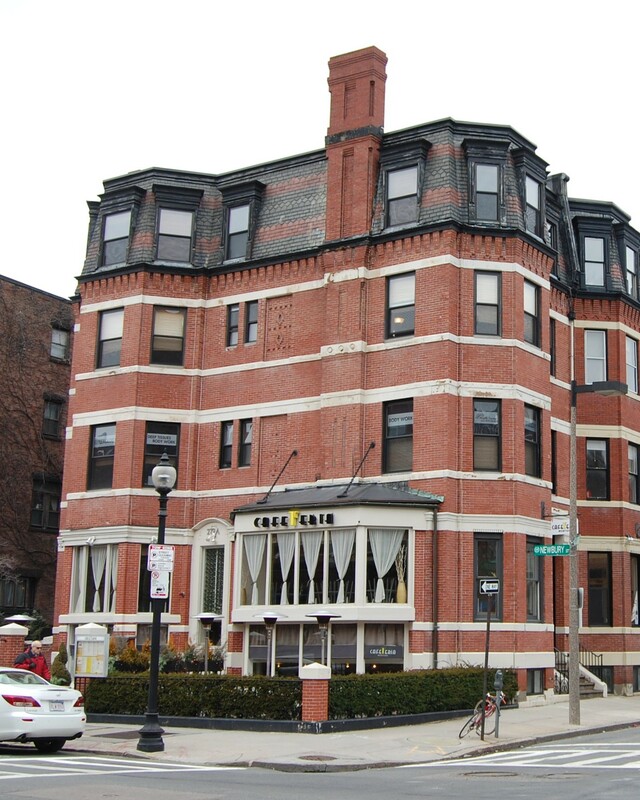 On May 1, 1984, the Board of Appeal allowed the expansion of the restaurant to the first floor of 36 Gloucester, but denied the appeal by the owners of 34 Gloucester to permit its basement to be used for a kitchen by 36 Gloucester. In September of 1985, Biswas Realty applied for (and subsequently received) permission to make various changes in the structure, including opening a new entrance and filling the existing entrances, refacing the existing bays, and removing the front fire escape. During the 1980s and 1990s, the restaurant was the Pineapple Café (in about 1983), Trudy’s (1985 to 1988), Echo (by 1988-1991), Miyako (1991-1999), and Saffron (1999-2005). In February of 2004, Biswas Realty applied for (and subsequently received) permission to convert the property from a restaurant and six apartments into a restaurant, four apartments, and a real estate office. In 2005, the restaurant became Inq. On October 12, 2006, 36 Gloucester (279-A Newbury) was purchased from the Biswas Realty Trust by JPGS LLC (Gaston Safar, manager of record). On the same day, JPGS LLC also purchased 34 Gloucester. 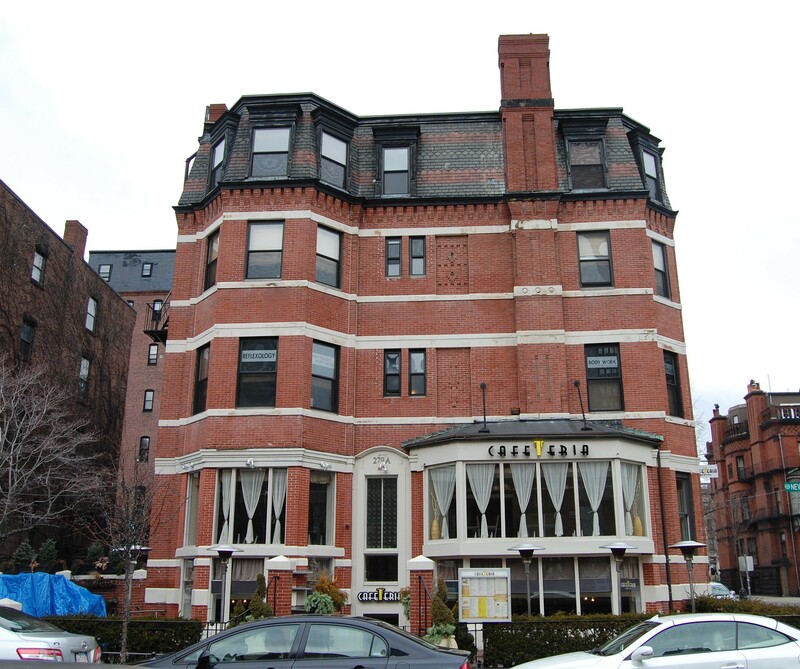 In 2007, the restaurant became Cafeteria Boston. The property changed hands, remaining a mixed residential and commercial building in 2017.